Add streaming music to your home entertainment. If youre listening more and more to Internet radio, music services or your own music library, doesnt it make sense to enjoy it all on your best-sounding system-without a lot of hassle? Now you can. 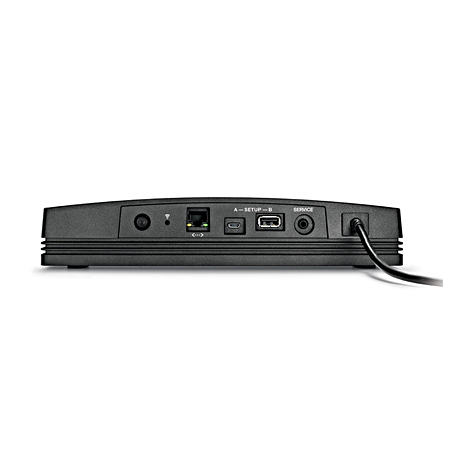 Just add the SoundTouch™ wireless adapter to your CineMate® 520, 220, 130 or 120 home cinema systems. With a home Wi-Fi® network, you can stream Internet radio, your music library and music services like Deezer™ and Spotify® with ease, and enjoy it with rich Bose® sound. Compatible with CineMate® 520, 130, 220 and 120 home cinema systems. Straightforward set up with free SoundTouch™ app for your computer, smartphone or tablet. Powerful control with the SoundTouch™ app. Six personalised presetsfor streaming your favourite music at the touch of a button. Works with your existing home Wi-Fi® network. The SoundTouch™ app makes it easy to explore new music and manage what you have. Use it to drag and drop any music source-a favourite playlist or Internet radio-to your six presets. Now theyre just a touch away, from anywhere in your home. But when you want to venture beyond your presets, use the app with your computer, smartphone or tablet to find other music. Browse the online musical universe or files from your own music library. You can also use the app to manage multiple systems in different rooms. The SoundTouch™ wireless adapter also enables your CineMate® 520, 130, 220 or 120 home cinema system to work with other SoundTouch™ systems throughout the house to create a multi-room listening experience. Thats why theres a SoundTouch™ system for every room-from small and portable speakers to outdoor systems. Start with any one SoundTouch™ system, and keep adding them whenever youd like. These systems work together to create a multi-room listening experience, listen to different music in different rooms or create customised zones.